Much is made of the case of Switzerland by our opponents in the pro-EU science lobby. On the 9th of February 2014, the Swiss people voted against the free movement of people in a referendum, and for the introduction of quotas. As a result, the EU responded by restricting access for Swiss researchers and scientists to Horizon 2020, demoting Switzerland to having only “partial access” to the programme. Pro-EU science groups highlight Switzerland as evidence that if we leave the EU, we will still have to accept freedom of movement if we want to participate in EU science. However, this analysis of the situation is flawed. The treatment of Switzerland was not a consequence of restricting free movement – no quotas were ever introduced to current EU free movement countries, and we know that the EU allows countries without free movement to take part in Horizon 2020 (e.g. Israel, Tunisia, Turkey, Ukraine etc). Indeed, the EU have stated explicitly on a number of occasions that it is this refusal to ratify the treaty with Croatia that is the driving force behind the sanctions. And the pressure on Switzerland has succeeded; the Swiss government agreed to ratify the treaty in March of this year, and Switzerland is expected to regain full access to Horizon 2020 in 2017. We could debate how this reflects on the EU until the cows come home, but using science to undermine a democratic vote in a sovereign nation, in order to further the political project’s ambitions, does not cast the EU in a positive light. More importantly is what this means for British involvement in EU science, and the answer is it largely depends on the UK deal with the EU post-Brexit. If our deal involved membership of the EEA, then access to EU science is automatically guaranteed, but so are our commitments to free movement. However, if instead the result is a simple free trade agreement with the EU, then free movement is not required. Out of the 16 non-EU countries that are associates to Horizon 2020 and the ERA, more than 10 are outside the EEA, and not one of them has a free movement treaty with the EU. Yet they are all full associates with the same rights and access to research funds that EU member states have. If a Brexit government does choose to implement immigration controls, our deal would put us outside the EEA, and our treatment will be more similar to the non-EEA members who currently participate in EU science. It is important to note as well that whilst Switzerland is currently participating with only partial access status, they are still very successful in EU science. Their partial association gives them full access to the Tier 1 ‘Excellent science’ pillar of Horizon 2020, whilst for Tier 2/3 they can apply and participate as a 3rd party country, funded by the national government. Whilst the Swiss government must provide the funds for Tier 2/3 activities, this is not additional spending for the Swiss taxpayer, in that the money that was originally channelled through the EU machine is now rerouted through the Swiss government. 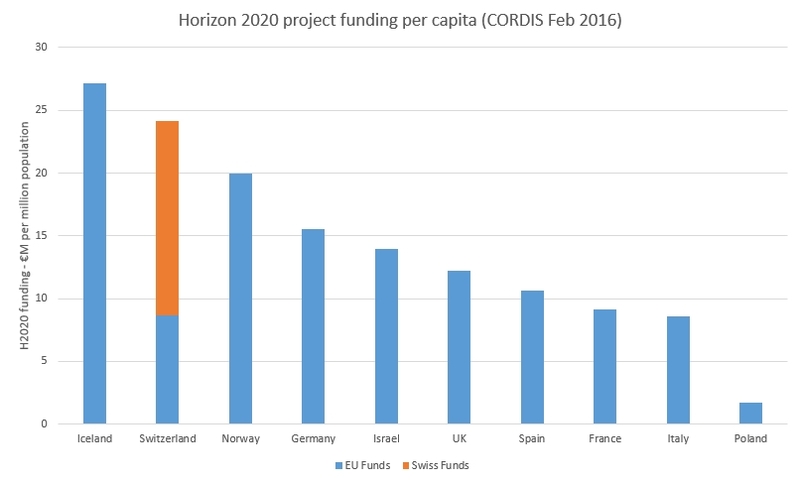 Despite their current situation, Switzerland still performs extremely well in Horizon 2020 (per capita), in comparison to the main EU member states (Figure 1). Scientists for Britain take no formal stance or endorsement on whether a UK exit deal should involve EEA membership or not – that is for a Brexit government to decide. But it is wrong to claim that UK participation in EU science or Horizon 2020 is dependent on our acceptance of free movement. The UK is in a uniquely strong position, both economically and scientifically, to negotiate its own bilateral agreement. We will receive a unique British deal, in which there are many possible models for our participation in EU science that do not involve free movement, and we believe that the public should be properly informed, and not mislead, on this topic. Mike Wigram is a PhD student at the University of York, studying plasma physics for fusion reactors. He graduated from the University of Manchester with a 1st class MPhys(Hons) in Physics. During his years as an undergraduate student, Mike worked for several months as an intern student at the Princeton Plasma Physics Laboratory (PPPL) in the USA, as well as with a private research company in Oxfordshire. He also has research experience in the field of plasma wakefield acceleration, for potential next-generation particle accelerators.